Two videos of a Fallout 4 stage presentation from E3 have made their way onto Bethesda's YouTube channel. 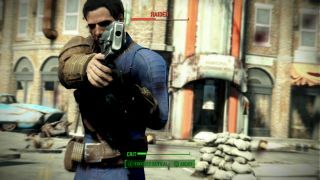 The in-game clips aren't new, but we do get to hear Todd Howard's thoughts on improving Fallout as a shooter. The team's first step was to get in touch with some very experienced FPS devs. "Since id software is part of our company, the first thing we did was call them. Alright, we're going to do this from scratch, give us some tips." There's a little more on Bethesda's open world design philosophy. "The world ultimately becomes the main character of our games. A lot of stuff we do, we want to show you that world, and you immediately think 'what would I do in that circumstance? Who would I want to be?' and that makes it much more personal to you, and much more of a different experience than other games, other types of entertainment." He adds: "The more you can say yes to the player, the better we are." The second video covers the new crafting and building systems that will let you construct houses at various sites throughout the wasteland. A couple of minutes in, Howard mentions that the Creation Kit mod tools will come out "early 2016". That feels slightly more optimistic than Pete Hines' time frame that puts mod tools "clearly into next year". Fallout 4 is out on November 10, so modders will have a couple of months to come up with ideas. Here are a few of our own.